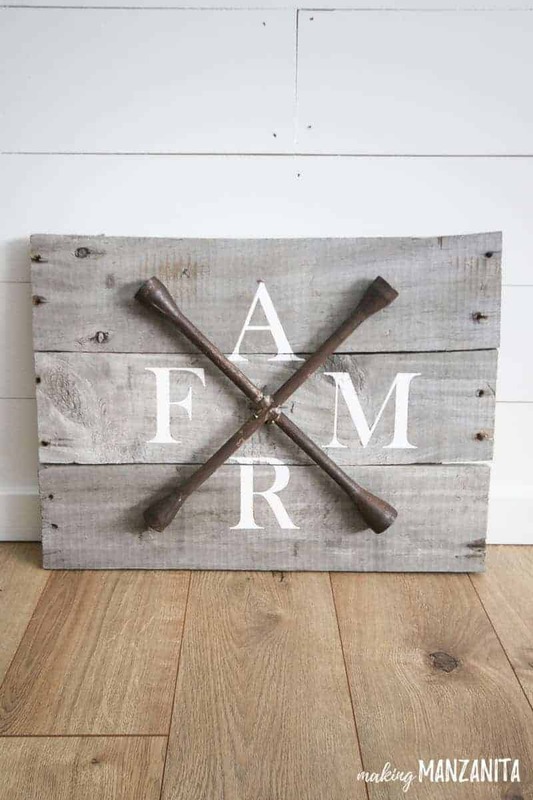 Calling all Fixer Upper fans, you’re going to love this DIY farmhouse sign made with pallet wood and a repurposed lug wrench. If you’re a thrifter like me….you will recognize this scenario… You’re strolling through the aisle of a thrift store and you see it. It’s the perfect piece of junk and you instantly know exactly what do do with it. That’s exactly what happened when I came across this rusty old lug wrench. 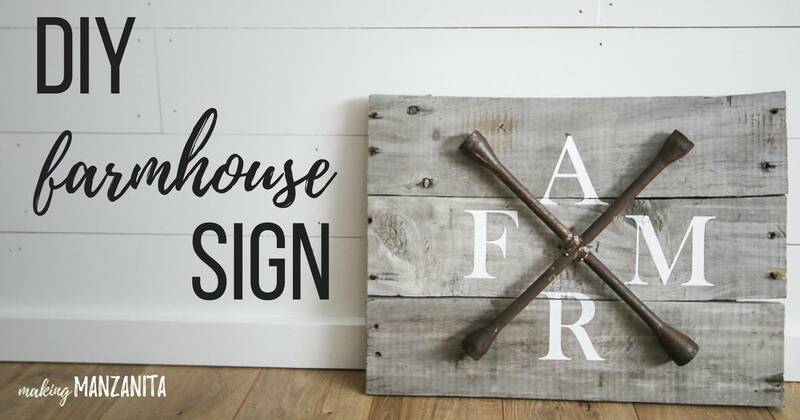 I could see the DIY farmhouse sign design in my head instantly. UPDATE: There’s a full video tutorial at the bottom of this post! Step 1. 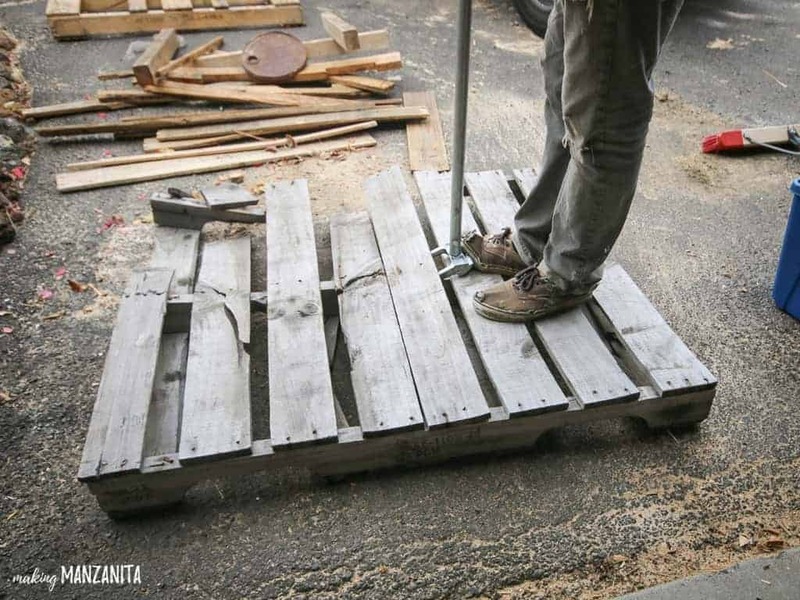 Take apart pallet (if necessary). If you are using pallet wood like we did, you’ll probably need to start by taking apart the pallet. Someday soon I promise to do a whole post about the best way to take apart a pallet, but until then…I can tell you that we love our Pallet Buster. Step 2. Cut wood and build sign. To make it a little easier, we ended up just cutting the pallet pieces directly in half, so our sign is 19.5 inches wide. We used three pallet pieces together. 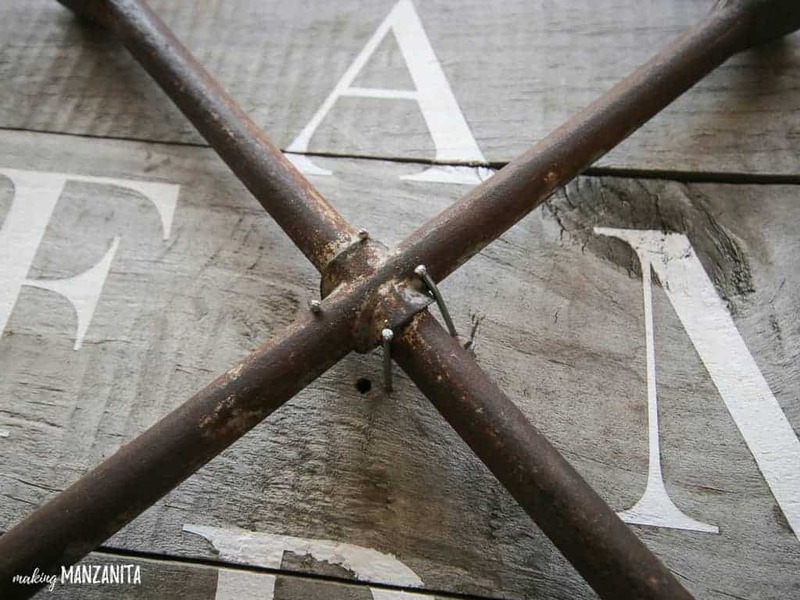 To build the sign, add two perpendicular pallet wood pieces on the back and nail them in to keep the boards together. 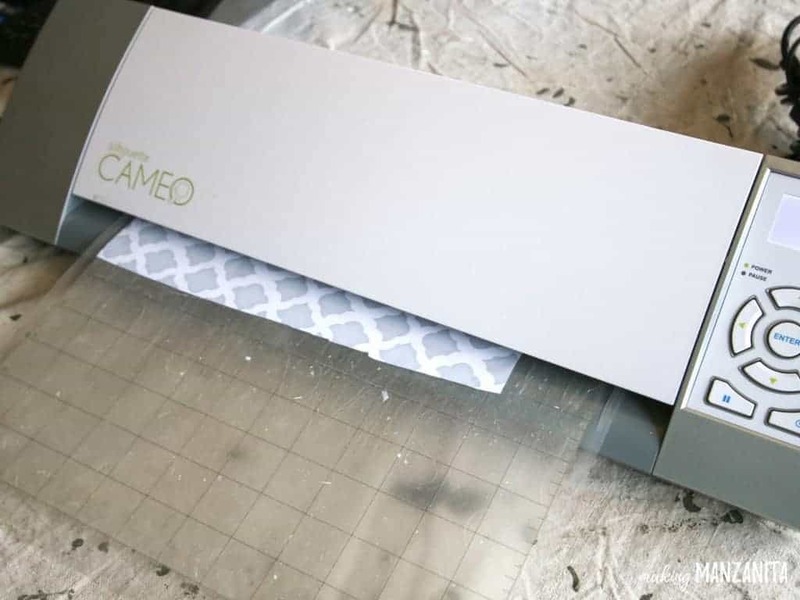 I used my handy Cameo and adhesive shelf liner/contact paper to make stencils with the letters for FARM. You could even do N E S W like a compass. Or you could really do any 4 letter word that you want…. What other 4 letter word ideas do you have? I swear the hardest part about this entire sign was trying to decide how to display the letters. When you look at similar designs online, they do it all sort of ways. I decided in the end to arrange my FARM letters similar to this WACO shirt that Joanna wears on Fixer Upper. It seemed to the be easiest for me to read quickly out of all of the designs. 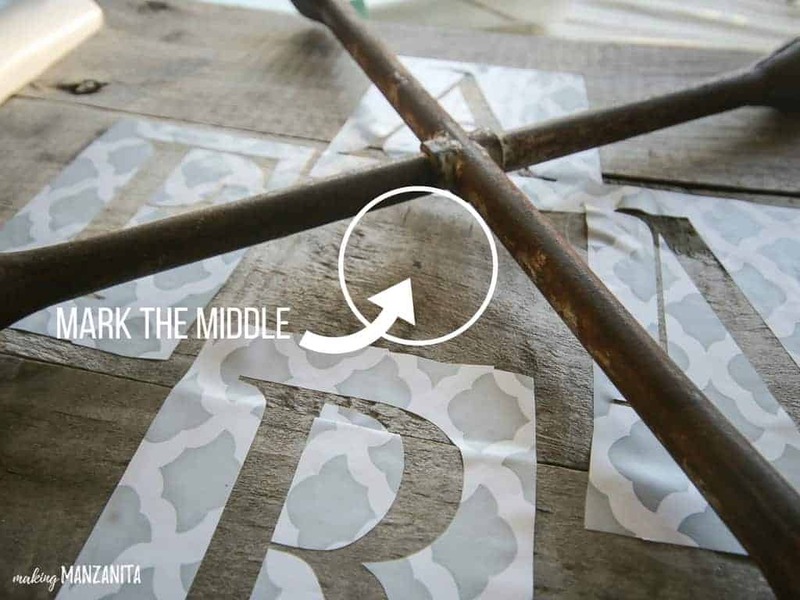 Before you start applying the stencil, you definitely want to measure the middle of the sign and determine where the lug wrench will go so you can line the letters up correctly. 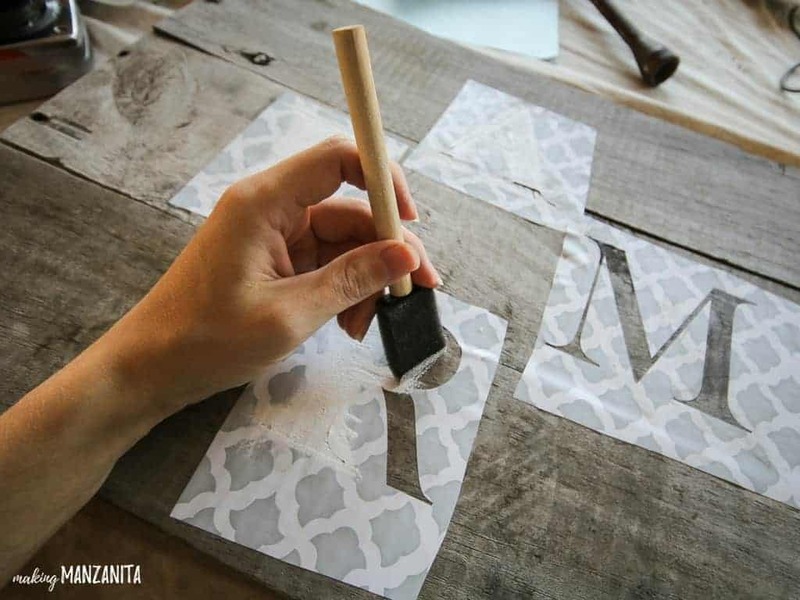 For the full tutorial on how to seal your stencil WITHOUT having any bleeding under your stencil and getting these nice crisp lines, you want to hop over to this post. This sign making hack has definitely changed the way that I DIY wood signs. Step 5. Paint over stencil. Using a foam brush, paint over the stencil. I usually do 2 coats. As one extra measure to avoid bleeding under your stencil, I also sort of “pounce” the brush directly down on the stencil rather than doing a brush movement. Step 6. Attach repurposed lug wrench. There are few different ways you could attach the lug wrench to the sign. We chose to add 4 nails around the corners to keep it in place. We originally tried to 2 very large nails bent over the wrench, but that didn’t work out. My hubby also mentioned you could drill a hole in the wood sign and feed some wire through to hold the wrench in place. To seal the sign, spray on a couple coats of this sealant. 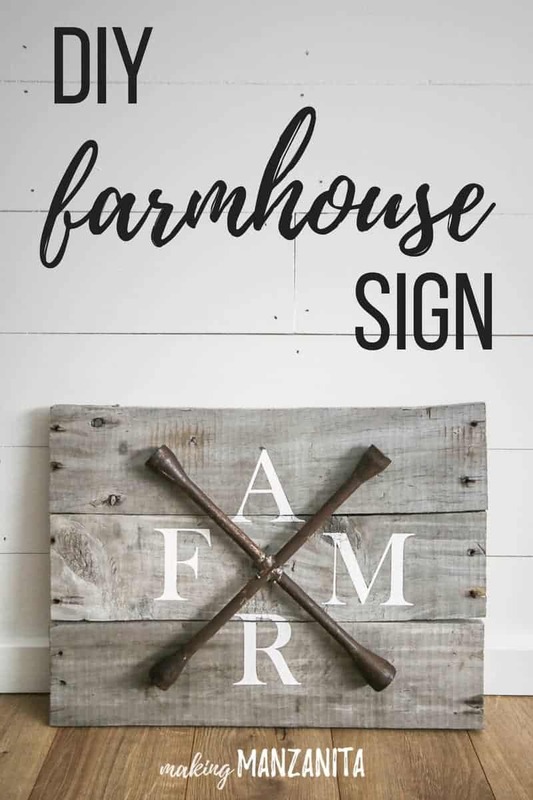 It does a great job of sealing the DIY farmhouse sign for indoor use. 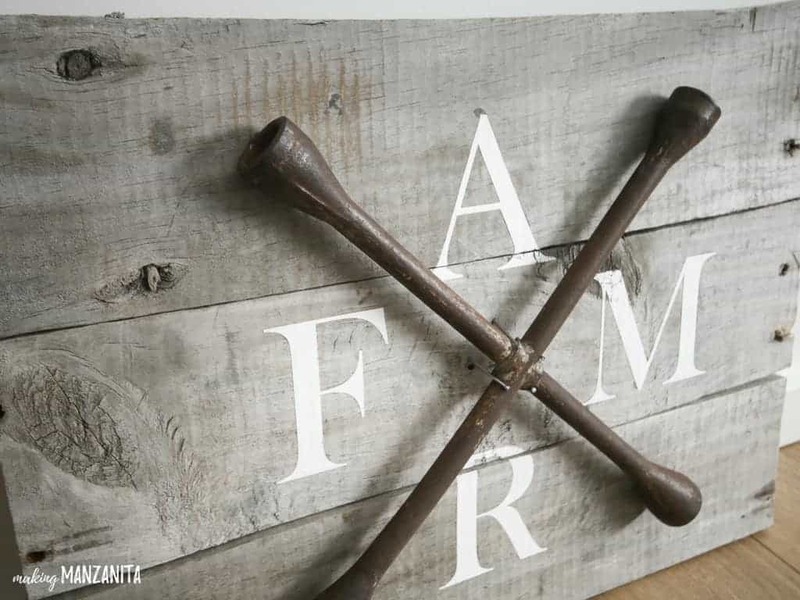 I’m kind of obsessed with how this DIY farmhouse sign with pallet wood and repurposed lug wrench turned out. I love it!! 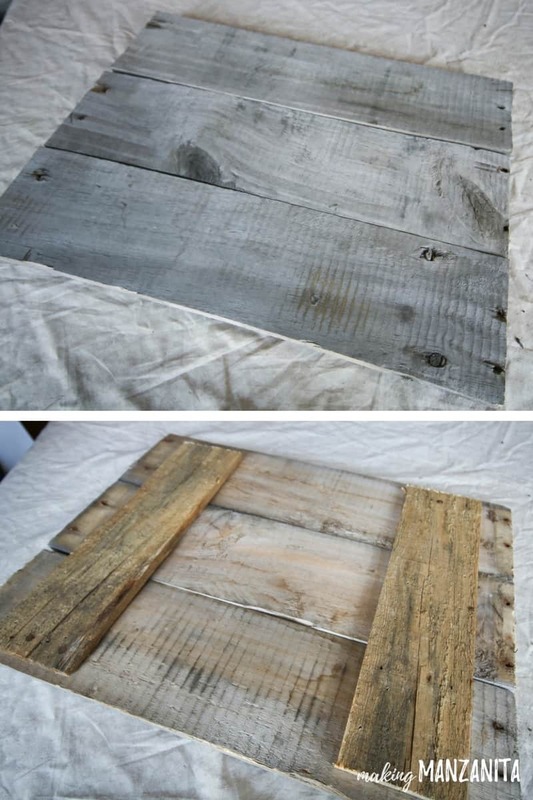 My favorite part is the grayish coloration of the reclaimed pallet wood. Every pallet is a different shape, size and color and the one we used had a great color to it, don’t you think? 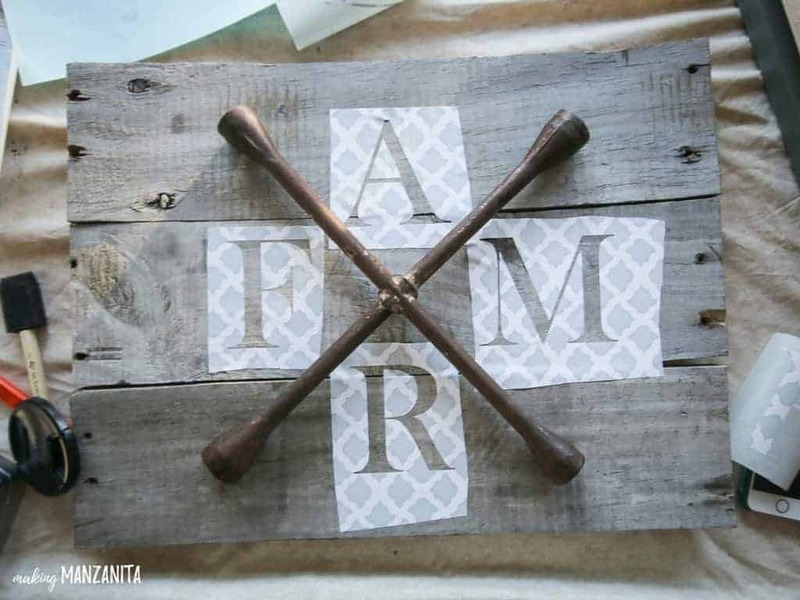 What word would you paint on your DIY farmhouse sign?? Here’s a replay of my live video tutorial for this project. Don’t forget to check out my video page for more video tutorials!